When he was still a child, John Denver was moved to write his first song by the rushing waters of a Colorado River tributary. In Let This Be A Voice, the adult songwriter returns to the Colorado’s mighty waters for the first time as an adult, taking an exciting raft trip with his children. Along the way, they marvel at the fossilized remains of ancient sea creatures and cavort in sparkling waterfalls. Denver even uses a riverside cavern as an impromptu concert hall, his music echoing off stone walls carved by time. 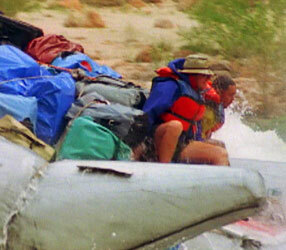 Once, riding the Colorado’s towering whitewater rapids was considered impossible. Today, however, the advent of modern inflatable rafts has allowed thousands of people every year to ponder the river canyon’s beauty — and fury — in safety. Indeed, up to 23,000 people take the 300-mile journey down the canyon each year with professional guides, with another 3,500 setting out on their own private expeditions. Either way, the river has become so popular that permits are required to limit the number of trips and prevent aquatic traffic jams. In fact, some private expeditions must wait a dozen years to take their turns, though you can usually reserve a spot on a guided trip just a few months in advance. In their floats down the Colorado, visitors may feel as if they’re making a conquest of an undiscovered country, but they are actually retracing the route of a remarkable traveler, a one-armed explorer who shared John Denver’s appetite for adventure and love for nature. Like Denver, he also found music in the pools and canyons of the Colorado River. His name was John Wesley Powell, and, in 1869, he led the first successful trip down the Colorado. The thousand-mile journey, made by 10 men in four high-sided rowboats, was considered suicidal at the time. But the 35-year-old Powell, a geologist and teacher who had lost an arm in the Civil War, proved up to the task. Though half the party abandoned the expedition before it was over and several members were killed by Indians, Powell emerged at the end with proof that the river could be tamed. Amidst the magnificence, however, Powell also found music. “The Grand Canyon is a land of song,” he wrote, in a sentiment that would be echoed generations later by a talented musician. “Mountains of music swell in the rivers, hills of music billow in the creeks, and meadows of music murmur in the rills that ripple over the rocks. Altogether it is a symphony of multitudinous melodies. All this is the music of waters.” If you raft the Colorado and follow in the path of Powell and Denver, you may someday hear that music for yourself.